"The four stained glass windows were installed in 1920 to commemorate the parishioners killed during the First World War. They are by Morris & Co of London which was founded by the pre-Raphaelite artist and designer William Morris. 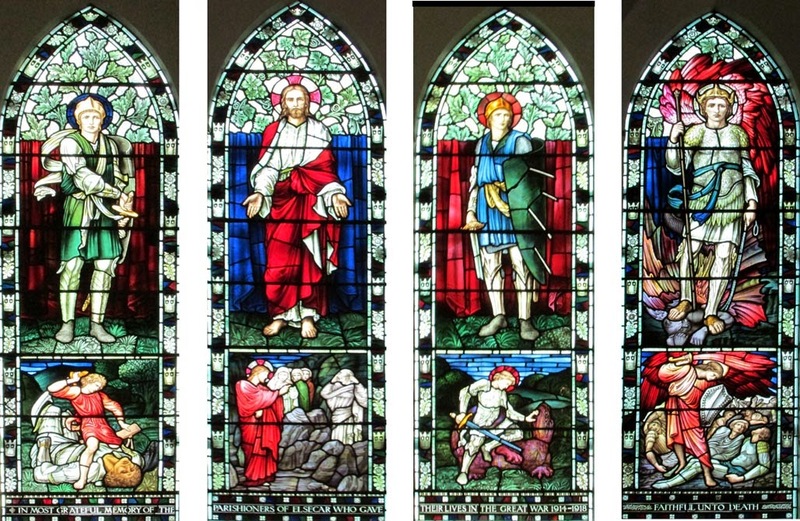 The windows are very striking and portray several Bible scenes. Starting from the left, the first shows a saint in white armour and a scene depicting David slaying Goliath. The next shows Christ in crimson robes and underneath, a panel showing the raising of Lazurus. The third pictures St Sebastian pierced with arrows and St George slaying a dragon. The last depicts St Michael trampling on Satan under his feet and a panel showing the raising of dead warriors." There are no names listed on these windows, however there is a plaque commemorating the WW1 Fallen of Elsecar elsewhere in the church.